Test cricket is the form of the sport of cricket with the longest duration, and is considered the game's highest standard. Test matches are played between national representative teams with "Test status", as determined and conferred by the International Cricket Council (ICC). The term Test stems from the fact of the form's long, gruelling matches being both mentally and physically testing. Two teams of 11 players each play a four-innings match, which may last up to five days (or longer in some historical cases). It is generally considered the most complete examination of a team's endurance and ability. The first officially recognised Test match took place between 15 and 19 March 1877 and was played between England and Australia at the Melbourne Cricket Ground (MCG), where Australia won by 45 runs. A Test match to celebrate 100 years of Test cricket was held in Melbourne between 12 and 17 March 1977, in which Australia beat England by 45 runs—the same margin as that first Test. In October 2012, the ICC recast the playing conditions for Test matches, permitting day/night Test matches. The first day/night game took place between Australia and New Zealand at the Adelaide Oval, Adelaide, on 27 November – 1 December 2015. Women's Test cricket is played over four days, with slight differences in format from men's Tests. Sides designated as "England" began to play in the late 18th century, but these teams were not truly representative. Early international cricket was disrupted by the French Revolution and the American Civil War. The earliest international cricket match was between USA and Canada, on 24 and 25 September 1844. This has never been officially considered a "Test match". Tours of national English sides abroad took place, particularly to the US, Australia and New Zealand. The Australian Aborigines team became the first organised overseas cricketers to tour England in 1868. Two rival English tours of Australia were proposed in the early months of 1877, with James Lillywhite campaigning for a professional tour and Fred Grace for an amateur one. Grace's tour fell through and it was Lillywhite's team that toured New Zealand and Australia in 1876–77. Two matches against a combined Australian XI were later classified as the first official Test matches. The first match was won by Australia, by 45 runs, and the second by England. After reciprocal tours established a pattern of international cricket, The Ashes was established as an ongoing competition during the Australian tour of England in 1882. Surprisingly beaten, a mock obituary of English cricket was published in the Sporting Times the following day: the phrase "The body shall be cremated and the ashes taken to Australia" prompted the subsequent creation of the Ashes urn. The series of 1884–85 was the first to be held over five matches: Shaw, writing in 1901, considered the side to be "the best ever to have left England". South Africa became the third team to play Test cricket in 1888–89, when they hosted a tour by an under-strength England side. Test matches are the highest level of cricket, although, statistically, their data form part of first-class cricket. Matches are played between national representative teams with "Test status", as determined by the International Cricket Council. As of June 2017[update], twelve national teams have Test status, the most recently promoted being Afghanistan and Ireland on 22 June 2017. Zimbabwe's Test status was voluntarily suspended, because of poor performances between 2006 and 2011; it returned to competition in August 2011. In January 2014, during an ICC meeting in Dubai, the pathway for new potential Test nations was laid out with the winners of the next round of the ICC Intercontinental Cup playing a 5-day match against the bottom ranked Test nation. If the Associate team defeats the Test nation, then they could be added as the new Test country and granted full membership. A list of matches, defined as "Tests", was first drawn up by Australian Clarence Moody in the mid-1890s. Representative matches played by simultaneous England touring sides of 1891–92 (in Australia and South Africa) and 1929–30 (in the West Indies and New Zealand) are deemed to have "Test status". In 1970, a series of five "Test matches" was played in England between England and a Rest of the World XI. These matches, originally scheduled between England and South Africa, were amended after South Africa was suspended from international cricket because of their government's policy of apartheid. Although initially given Test status (and included as Test matches in some record books, including Wisden Cricketers' Almanack), this was later withdrawn and a principle was established that official Test matches can only be between nations (although the geographically and demographically small countries of the West Indies have since 1928 been permitted to field a coalition side). Despite this, in 2005, the ICC ruled that the six-day Super Series match that took place in October 2005, between Australia and a World XI, was an official Test match. Some cricket writers and statisticians, including Bill Frindall, ignored the ICC's ruling and excluded the 2005 match from their records. The series of "Test matches" played in Australia between Australia and a World XI in 1971–72 do not have Test status. The commercial "Supertests" organised by Kerry Packer as part of his World Series Cricket enterprise and played between "WSC Australia", "WSC World XI" and "WSC West Indies" from 1977 to 1979 have never been regarded as official Test matches. In the mid 2010s, the ICC evaluated proposals for dividing Test cricket into two tiers, with promotion and relegation between Tier-1 and Tier-2. These proposals were supported by some national cricket govening bodies, but opposed by others. These proposals were ultimately not implemented. A standard day of Test cricket consists of three sessions of two hours each, the breaks between sessions being 40 minutes for lunch and 20 minutes for tea. However the times of sessions and intervals may be altered in certain circumstances: if bad weather or a change of innings occurs close to a scheduled break, the break may be taken immediately; if there has been a loss of playing time, for example because of bad weather, the session times may be adjusted to make up the lost time; if the batting side is nine wickets down at the scheduled tea break, then the interval may be delayed until either 30 minutes has elapsed or the team is all out; the final session may be extended by up to 30 minutes if 90 or more overs have not been bowled in that day's play (subject to any reduction for adverse weather); the final session may be extended by 30 minutes (except on the 5th day) if the umpires believe the result can be decided within that time. Today, Test matches are scheduled to be played across five consecutive days. However, in the early days of Test cricket, matches were played for three or four days. Four-day Test matches were last played in 1973, between New Zealand and Pakistan. Until the 1980s, it was usual to include a 'rest day,' often a Sunday. There have also been 'Timeless Tests', which did not end after a predetermined maximum time. In 2005, Australia played a match scheduled for six days against a World XI, which the ICC sanctioned as an official Test match, though the match reached a conclusion on the fourth day. In October 2017, the ICC approved a request for a four-day Test match, between South Africa and Zimbabwe, which started on 26 December 2017 and ended on the second day, 27 December. The ICC will trial the four-day Test format until the 2019 Cricket World Cup. There have been attempts by the ICC, the sport's governing body, to introduce day-night Test matches. In 2012, The International Cricket Council passed playing conditions that allowed for the staging of day-night Test matches. The first day-night Test took place during New Zealand's tour to Australia in November 2015. Test cricket is played in innings (the word denotes both the singular and the plural). In each innings, one team bats and the other bowls (or fields). Ordinarily four innings are played in a Test match, and each team bats twice and bowls twice. Before the start of play on the first day, the two team captains and the match referee toss a coin; the captain who wins the toss decides whether his team will bat or bowl first. In the following scenarios, the team that bats first is referred to as Team A and their opponents as Team B. Usually the teams will alternate at the completion of each innings. Thus, Team A will bat (and Team B will bowl) until its innings ends, and then Team B will bat and Team A will bowl. When Team B's innings ends, Team A begin their second innings, and this is followed by Team B's second innings. The winning team is the one that scores more runs in their two innings. The team is "all out". This typically occurs when a team has lost ten wickets (ten of the eleven batsmen having been dismissed) and are "bowled out". It may occasionally occur with the loss of fewer wickets if one or more batsmen are unavailable to bat (through injury, for example). The team's captain declares the innings closed, usually because they believe they have enough runs. A declaration before the innings starts is called an innings forfeiture. The team batting fourth score the required number of runs to win. The prescribed time for the match expires. If, at the completion of its first innings, Team B's first innings total is 200 or more fewer than Team A's, the captain of Team A may (but is not required to) order Team B to have their second innings next. This is called enforcing the follow on. In this case, the usual order of the third and fourth innings is reversed: Team A will bat in the fourth innings. It is rare for a team forced to follow on to win the match. In Test cricket it has only happened three times, although over 285 follow-ons have been enforced: Australia was the losing team on each occasion, twice to England, in 1894 and in 1981, and once to India in 2001. If the whole of the first day's play of a Test match has been lost because of bad weather or other reasons like bad light, then Team A may enforce the follow on if Team B's first innings total is 150 or more fewer than Team A's. During the 2nd Test between England and New Zealand at Headingley in 2013, England batted first after the first day was lost because of rain. New Zealand, batting second, scored 180 runs fewer than England, meaning England could have enforced the follow on, though chose not to. This is similar to four-day first-class cricket, where the follow on can be enforced if the difference is 150 runs or fewer. If the Test is 2 days or fewer then the "follow-on" value is 100 runs. After 80 overs, the captain of the bowling side may take a new ball, although this is not required. The captain will usually take the new ball: being harder and smoother than an old ball, a new ball generally favours faster bowlers who can make it bounce more variably. The roughened, softer surface of an old ball can be more conducive to spin bowlers, or those using reverse swing. The captain may delay the decision to take the new ball if he wishes to continue with his spinners (because the pitch favours spin). After a new ball has been taken, should an innings last a further 80 overs, then the captain will have the option to take another new ball. All four innings are complete. The team batting fourth are all out before overtaking the other team, usually before matching the other team's score. The team that batted third are the winners by a margin equal to the difference in the aggregate runs scored by the two teams (for example, "Team A won by 95 runs"). Very rarely (in over 2,000 Test matches played, it has only happened twice) the scores can end level, resulting in a tie. The team batting in the fourth innings overtakes the opposing team's run total. The match ends, and the team batting fourth is the winner by a margin equal to the number of wickets still to fall in the innings (for example, "Team B won by five wickets"). The third innings concludes with the team that batted twice still trailing the team that batted once. The match ends without playing a fourth innings. The team that batted only once is the winner by a margin equal to "an innings" plus the difference in aggregate run totals of the teams (for example, "Team B won by an innings and 26 runs"). Time for the match expires without a result being reached. This usually occurs at the end of the last day of the match. The result is a draw: there is no winner, no matter how superior the position of one of the sides. Rain causing a loss of playing time is a common factor in drawn matches, although matches may be drawn even without interference from the weather: usually as a result of poor time management or an intentional effort on the part of one team to avoid losing. The match is abandoned because the ground is declared unfit for play. This has occurred three times, resulting each time in a draw being declared: England v Australia at Headingley, Leeds, 1975 (vandalism); West Indies v England at Sabina Park, Kingston, Jamaica, 1998 (dangerous ground); West Indies v England at Sir Vivian Richards Stadium, Antigua, 2009 (dangerous ground). The match is awarded through a forfeiture. If a team refuses to take the field of play, the umpires may award the match to the opposing team. This has only happened once in Test cricket, in the 2006 fourth Test between England and Pakistan. 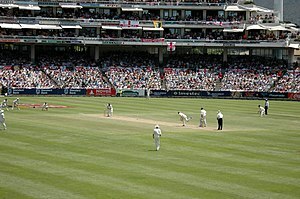 Test cricket is almost always played as a series of matches between two countries, with all matches in the series taking place in the same country (the host). Often there is a perpetual trophy that is awarded to the winner, the most famous of which is the Ashes contested between England and Australia. There have been two exceptions to the bilateral nature of Test cricket: the 1912 Triangular Tournament, a three-way competition between England, Australia and South Africa (hosted by England), and the Asian Test Championship, an event held in 1998–99 and 2001–02. The number of matches in Test series has varied from one to seven. Up until the early 1990s, Test series between international teams were organised between the two national cricket organisations with umpires provided by the home team. With the entry of more countries into Test cricket, and a wish by the ICC to maintain public interest in Tests in the face of the popularity of one-day cricket, a rotation system was introduced that sees all ten Test teams playing each other over a six-year cycle, and an official ranking system (with a trophy held by the highest-ranked team). In this system, umpires are provided by the ICC. An elite panel of eleven umpires has been established, and the panel is supplemented by an additional International Panel that includes three umpires named by each Test-playing country. The elite umpires officiate almost all Test matches, usually not Tests involving their home country. Several pairs of Test teams have established perpetual trophies which are competed for whenever teams play each other in Test series. A The Anthony De Mello Trophy is awarded for India–England test series played in India, whilst the Pataudi Trophy is for series played in England. "Matches" is no. matches + no. series played in the 12–24 months since the May before last, plus half the number in the 24 months before that. There has been no World Cup for Test cricket conducted thus far. However, a league competition for Test cricket will begin in 2019–21. The schedule for this Championship is a set of typical bilateral series in various countries, where one team is the host and other team is the visitor. The length of each series will vary between 2 matches and 5 matches. ^ Bond, David (29 July 2013). "Test cricket: Does the oldest form of the game have a future?". BBC. Retrieved 21 December 2016. ^ "Adam Gilchrist's Cowdrey Lecture, 2009". ESPN CricInfo. 24 June 2009. Retrieved 21 December 2016. ^ Lifeless pitches should not be accepted, The Daily Telegraph. Retrieved 1 August 2009. ^ "Knight's return to proving ground", Retrieved 1 August 2009. ^ "Adam Gilchrist's Cowdrey Lecture", 2009, ESPNcricinfo. Retrieved 1 August 2009. ^ Australia v England 1st Test 1876/1877 – ESPNcricinfo. ^ Australia v England Centenary Test – ESPNcricinfo. ^ a b "ICC paves way for Day-Night Tests". Wisden India. 29 October 2012. ^ a b "First day-night Test for Adelaide Oval". ESPNCricinfo. Retrieved 29 June 2015. ^ United States of America v Canada 1844 – ESPNcricinfo. ^ Zimbabwe Cricket Side Resume International Test Play After Six-Year Break – Voice of America. ^ "Ireland and Scotland to get Test chance as ICC approves play-off". BBC Sport. BBC. 10 April 2014. Retrieved 10 April 2014. ^ "NZC 'big supporter' of two-tier Test system". ESPNcricinfo. 18 July 2016. Retrieved 10 August 2016. ^ "Afghanistan ready to play Tests - ACB chief executive". ESPNcricinfo. 4 September 2016. Retrieved 5 September 2016. ^ "BCB vice-president against two-tier Test system". ESPNcricinfo. 27 June 2016. Retrieved 10 August 2016. ^ "BCCI against four-day Tests, two-tier system". ESPNcricinfo. 31 August 2016. Retrieved 31 August 2016. ^ "ICC planning two Test divisions amid major overhaul". ESPNcricinfo. 1 June 2016. Retrieved 10 August 2016. ^ "Two-tier proposal shelved at ICC meeting". ESPNcricinfo. 7 September 2016. Retrieved 21 October 2016. ^ "Baseball-style conference structure proposed for Tests". ESPN Cricinfo. Retrieved 21 October 2016. ^ "The Laws of Cricket – Law 15.8". Lords.org. Archived from the original on 24 November 2012. Retrieved 18 July 2013. ^ "ICC Standard Test Match Playing Conditions ("Playing Conditions") cl 16.1.1" (PDF). Archived from the original (PDF) on 11 January 2012. Retrieved 18 July 2013. ^ "Playing Conditions cl 16.2" (PDF). Archived from the original (PDF) on 11 January 2012. Retrieved 18 July 2013. ^ "Cremer senses opportunity in shorter contest". ESPN Cricinfo. Retrieved 19 December 2017. ^ "Test, ODI leagues approved by ICC Board". ESPN Cricinfo. Retrieved 13 October 2017. ^ "South Africa to play Zimbabwe in inaugural four-day Test". ESPN Cricinfo. Retrieved 13 October 2017. ^ "Lord's could host first day night Test in May 2010". ESPNcricinfo. Retrieved 18 July 2013. ^ "LAW 13 - INNINGS". Lords.org. Retrieved 22 December 2017. ^ "Law 14 – The follow-on". MCC. Retrieved 29 September 2017. ^ "HowSTAT! Winning after Following-On". Howstat.com. Retrieved 22 December 2017. ^ "2nd Test: England v New Zealand at Leeds, May 24–28, 2013 | Cricket Scorecard". ESPNcricinfo. Retrieved 18 July 2013. ^ "Law 4 – The ball". MCC. Retrieved 29 September 2017. ^ "On This Day: 19 August". BBC News. Retrieved 18 December 2010. ^ "1st Test: West Indies v England at Kingston, Jan 29 – Feb 2, 1998 | Cricket Scorecard". ESPNcricinfo. Retrieved 18 July 2013. ^ "2nd Test: West Indies v England at North Sound, Feb 13–17, 2009 | Cricket Scorecard". ESPNcricinfo. Retrieved 18 July 2013. ^ "Law 16 – The result". MCC. Retrieved 29 June 2017. ^ "England awarded abandoned Oval Test 'win'". The Guardian. London. 1 February 2009. Retrieved 27 March 2010. ^ "Test abandoned after ball dispute". BBC News. 20 August 2006. Retrieved 27 March 2010. ^ "Australia v England, Seventh Test, 1970–71". ESPNcricinfo. Retrieved 18 July 2013. ^ Rajesh, S. (16 April 2011). "Neutral umpires". ESPNcricinfo. Retrieved 30 March 2012. ^ "India-England series played for Anthony De Mello trophy: BCCI". 6 November 2012. Retrieved 3 June 2016. ^ "Southern Cross Trophy, 1999/00". Retrieved 3 June 2016. ^ "Statistics / Statsguru / Test matches / Team records". Retrieved 3 June 2016. ^ "Test trophy to be named after Clive Lloyd". 28 July 2001. Retrieved 3 June 2016. ^ "India vs Bangladesh 2016 Test series to be named Ganguly-Durjoy Trophy". 26 May 2016. Retrieved 22 December 2017. Origin of the name "Test"